On the heels of yesterday’s (reportedly very close and contentious) win for American Hustle at the New York Film Critics Circle, today the National Board of Review gathered what we assume was a panel of clipboard-clutching schoolmarms in a harshly lit, linoleum-lined room to pass their stern judgment on this year’s movies. And, like the NYFCC, the Board proved there is no clear, conventional choice this year by picking Spike Jonze’s Her as the best movie of 2013, and Jonze the best director. 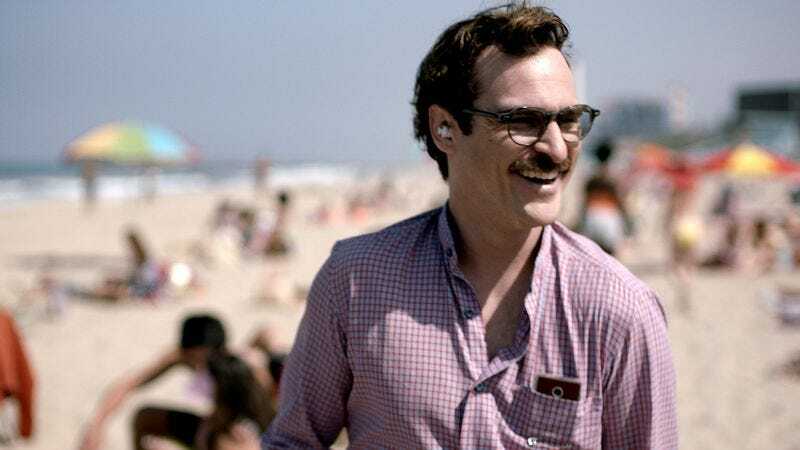 Alas, the funny, surprisingly moving (seriously, go see it) love story of one man’s relationship with his operating system didn’t pick up any acting awards for Joaquin Phoenix. That honor went to Bruce Dern for Nebraska, which also made a big leap forward in Oscar prognostication pools by landing in the NBR’s Top 10 Films list, and netting a Best Supporting Actor win for Will “MacGravitas” Forte. Other notables to consider: Emma Thomspon and Octavia Spencer got their first recognitions for Saving Mr. Banks and Fruitvale Station, respectively, while the latter continued to pick up “breakthrough” accolades for Michael B. Jordan and director Ryan Coogler. Sarah Polley’s Stories We Tell took Best Documentary, Hayao Miyazaki’s The Wind Rises got Best Animated Feature, and the NBR has already seen The Wolf Of Wall Street and apparently it’s pretty good. The complete list is below.